Johan Helmich Roman is often called the "father of Swedish music," despite his mom being of German descent, and his dad's family originally from Finland. Roman was born in the Swedish capital of Stockholm, and probably had his first music lessons from his dad, who was a musician at the royal chapel. At the age of 17, Roman played alongside his father at the royal chapel, the violin and oboe being the two instruments he specialized in. In 1715, the king granted Roman permission to study abroad, where he spent six years in London, which brought him in contact with the Italian composers working there at the time, most notably Bonocini, Geminiani, and Veracini. Of course, the greatest musical figure at the time was no doubt Handel, whom Roman greatly admired and whose music largely influenced Roman. Upon returning to Sweden in 1721, Roman became the deputy master of the royal chapel, and later 1727 the principal master of the court orchestra. Under his leadership, the orchestra transformed from a wretched state into a disciplined modern ensemble. In 1731, he even scheduled the first public concerts in Sweden, in which music was no longer limited to the royalty and clergy. This was at the time almost unprecedented in Europe, as the only other two cities that had known public concerts were Paris and London. His move would forever change the Swedish musical culture, in the progressive-looking manner. He would make another extended musical journey in 1735, this time visiting France, Italy, and Germany, in addition to returning to England, this time soaking up even more of the latest musical styles, which were along the lines of the late Baroque and galant style. As a composer, Roman wrote works that reflected the styles popular at the time, like symphonies, overtures, concertos, trio sonatas, cantatas, etc. Interestingly, for demonstrating the "suitability of the Swedish language to church music," Roman was elected a member of the (Swedish) Royal Academy of Science. 1741 marked a turning point in Roman's career. His long time patroness Queen Ulrika Eleonora died, and because she was childless and Sweden's humiliating defeat of the Hats' Russian War, meant that the heir of the Swedish throne was demanded by Empress Elizabeth of Russia as Adolf Fredrik of Holstein-Gottorp. Both Adolf Fredrik and his wife Lovisa Ulrika were talented amateur musicians. Adolf Fredrik played the cello, and Lovisa Ulrika was an accomplished harpsichordist herself. In fact, Lovisa Ulrika was the younger sister of Frederick the Great, and she certainly was familiar and immersed in the blossoming music culture of his brother's court. This should have been the ideal scenario for Roman, if it weren't the case that the crown prince and princess brought their own musicians from Germany, setting up competing venues and events to the already established Swedish court orchestra. To make matters worse, Roman became a widower a second time in 1744, and his increasingly worsened hearing made him resign from his position in 1745. His retirement wasn't exactly clean, so to speak, as he was summoned back in 1751 to write the funeral music of King Fredrik I and the coronation (finally) of Adolf Fredik. Aside for Swedish classical music connoisseurs, most of Roman's music remains unheard of outside of Sweden. His most famous and most performed music, is his Drottningholm Music, or Music for a Royal Wedding, written for the grand wedding of Adolf Fredrik and his wife in Lovisa Ulrika in 1744. The entire ceremony and festivities lasted for 4 days, so I can imagine Roman and his musicians having their hands full. For Roman, it must have been difficult, having lost his wife just 2 months before. In total, the music is comprised of 24 movements, which in a way is a large orchestral suite by itself. However, it was not meant to be played sequentially in its entirety. Depending on the setting and nature of the ceremony, different selections were chosen. There is no record of exactly which movements were played when and where, so much has been left to scholarly speculation. The 24 pieces show a great variation in orchestration, mood, and form, something which is almost a must given the purpose the music was written for. Festive music won't be complete without flaring trumpets and horns and the percussive timpani, upbeat and brisk dance music is accompanied by the flute or recorder, and serene passages are aided by the oboe or often completely reduced to just the strings and continuo. Remember how much Roman revered Handel? Well, in Drottningholm Music, you get to hear that first-hand, in movements No. 20 and No. 21, which the keen listener cannot miss the uncanny similarity to Handel's Water Music. I've posted them in the second video of the samples down below, which the avid listener is welcome to judge for yourself. There is an additional work on the CD, titled a Concerto Grosso in B flat. It is a peculiar work, which scholars have now dismissed as an authentic work by Roman. It is odd because of its scoring calls for a concertino group of two violins and harpsichord, but in essence, it's more like a harpsichord solo concerto, with the harpsichord dominating in pretty much all the movements. The extended solo harpsichord passage also reminds me of Handel's organ concertos. The Drottningholm Baroque Ensemble, led by Nils-Erik Sparfled, is a Swedish period ensemble founded in 1971, who have a few dozen recordings on their resume, ranging from the typical Baroque repertoire to the early classical. They've had a few recordings on the label Musica Sveciae, which was created to record Swedish classical music, from early music to 20th century. Many Musica Sveciae are devoted to Johan Roman, showcasing his versatility. In this 1994 recording, Drottningholm Baroque Ensemble has a style that is reminiscent of Pinnock's English Concert and Hogwood's AAM. Their size is typical of an early music ensemble, with brisker speeds, and general phrasing and sound what you expect from period practices. Yet, their tempos are a tad rigid and other aspects of their music playing are rather safe, viewed of course in today's hindsight. 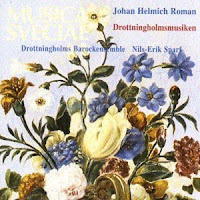 Yet, compared to other recordings which use modern orchestras, incidentally which I own one myself, Drottningholm Baroque Ensemble's playing is still a few leagues ahead in terms of a gratifying early music listening experience. 2011 also marks the year where, at least on official document, I've said farewell to the "single" status. I'm not royalty, but listening to Roman's Drottningholm Music nonetheless makes me feel completely deserving of wedding my wife. Those who are reading, hopefully 2012 is a good year for you too !